➡ Updated 1/14/19: I have revised my opinion of Drobo devices. After experiencing multiple, serious data loss events on multiple Drobo models, even recent ones, I no longer consider them safe for my data. ➡ Updated 11/23/09: The new Drobo S is now available. 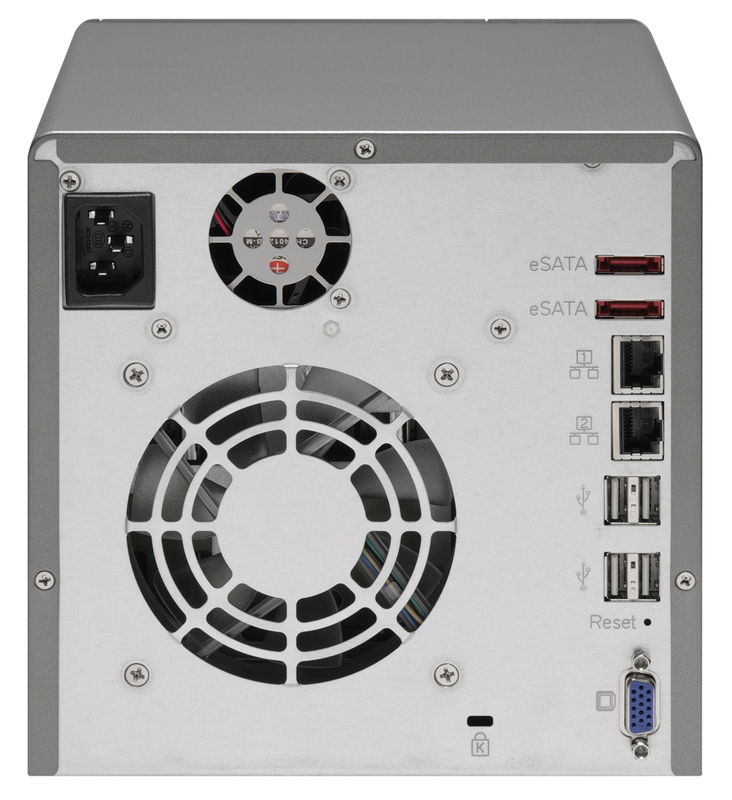 It has five drive slots, single or dual-drive redundancy, and triple interfaces (eSATA, FW800 and USB 2.0). My review of the new Firewire Drobo is somewhat overdue, but I wanted to spend a few good months with it before I wrote it. I have now spent that time, and am happy to say this new Drobo can be an avid computer user’s single storage device. Whatever reservations I had about the first-generation Drobo were eliminated by this new version, and I can now wholeheartedly recommend it to anyone who needs to store a large amount of data and safeguard against a hard drive failure. You may or may not know that I also reviewed the original Drobo. I published that review in December of 2007, after spending about a month with a USB Drobo, and updated it frequently since then, outlining the various good or bad points I found during my heavy-duty use of the device. Since that time, I became the owner of four Drobos (three USB Drobos and one Firewire Drobo) and found a couple of firmware bugs — I’m not claiming to be the first one to have found them, just saying I also found them — which were later addressed by firmware upgrades. The bugs were an overestimation of used space, and a significant drop in transfer speeds after the Drobo’s used space reached 80% or greater of the total available space. I had a number of different issues with my Drobos, all of which were detailed in my original review, and are now resolved. I also wrote about the Drobo from the perspective of product design for the consumer and corporate markets. Tom Loverro, one of the execs from Data Robotics, responded at length to my article with some very interesting insights about the inception and introduction of the product to those markets. I can vouch for the faster read/write performance myself. As a matter of fact, I can safely say that the performance approaches that of my WD My Book Studio Edition II, which is also a Firewire 800 device, that I have used in both RAID 0 and RAID 1 configurations. In layman’s terms, I can copy about 800 MB – 1 GB per minute to my Drobo, while I can copy about 1 GB – 1.2 GB per minute to my WD My Book Studio Edition II drive in RAID 1 config. These are large files I’m copying, ranging in size from 1-4 GB. If we do some quick math with the official figures, we can see that you could get up 2040 MB or about 2 GB per minute written to the Drobo over a Firewire 800 connection per the specs. In my real world experience, I was able to get about half that, as you can see above. I don’t think that’s a bad thing. Again, you have to compare the Drobo with another Firewire 800 device, and I did. If I can get about the same performance from my Drobo, which has to write the data across four drives, as I can get from my WD Studio Edition II, which only has two drives to worry about, then I’m pretty happy. 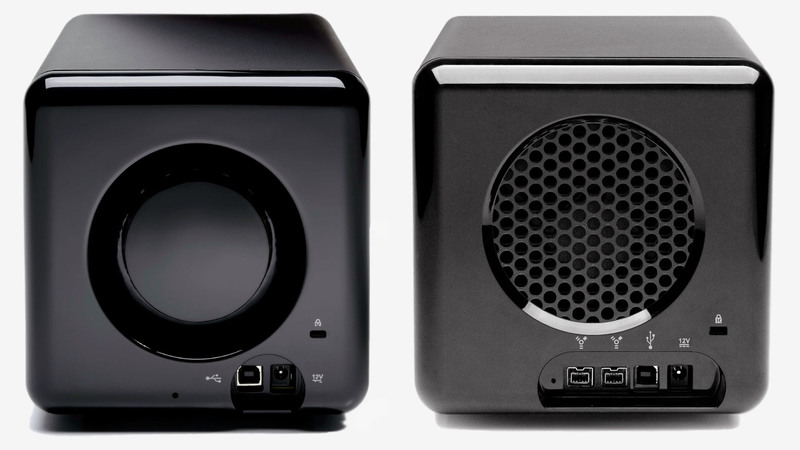 Have a look at this photo to get a better look at the different back design for the new Drobo. You can see the two Firewire 800 connectors, the USB 2.0 and DC connectors and the different grille design below. In the other-things-that-are-different department, I noticed that Drobo now allows people to format its volumes in the EXT3 file system (Linux), in addition to NTFS, FAT32 and HFS+, although they do say that Linux support is in beta on their website. It has nothing to do with the new Drobo 2.0 hardware, as this involved a firmware upgrade and a Drobo Dashboard upgrade, not a parts upgrade, but it’s a pretty cool move on Data Robotics’ part. Another thing that looks a bit different is the power supply. The original one was a simple plastic brick, but the new one has a line motif going across it, parallel to its long axis. 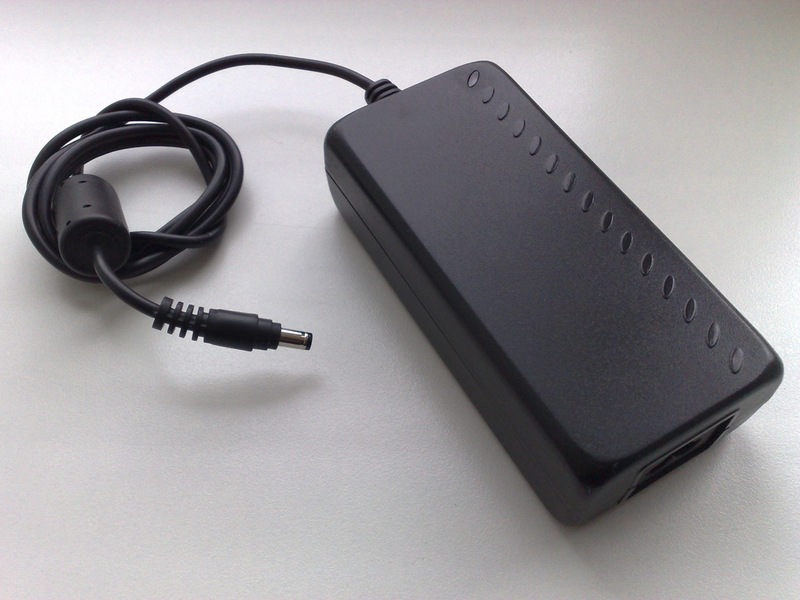 This newer power supply was also shipped with some of the late builds of the previous-generation USB Drobo. If you look at one of the photos I posted above, the one of the new Drobo’s back, you’ll see a Reset slot. Can you see it, to the left of the FW800 connectors? It was present on the back of the original USB Drobo as well, to the left of its main (and only) USB connector. Sure enough, there’s even a tech note about it, which explains how to wipe the Drobo clean. This means it’s a dangerous little slot, so don’t use it unless you really mean it. I never got around to posting the Drobo’s dimensions in my original review, so here they are. They haven’t changed with the new Drobo. I like the form factor, I hope it keeps staying the same. In all likelihood, it will stay the same for this four-drive version of the Drobo. I know, thanks to a product survey sent out to selected Drobo customers, that Data Robotics is thinking about or working on an 8-drive and possibly a 16-drive version of the Drobo, one of which (or both) is rack-mountable. Those should be some very interesting products for the enterprise or for those with larger storage needs than what the four-drive Drobo can provide. I understand that Data Robotics is also working on the capability to safeguard against two drive failures in those larger Drobo models, which should be a very cool feature indeed. In terms of storage flexibility and the safety of one’s data, I believe the Drobo is unmatched. There is no other product like it on the market. The only thing that’s holding it back at the moment, storage-wise, is the capability of the hard drives themselves. Only recently have the problems present in the 1.5TB drives from Seagate been worked out, and only in recent weeks have I seen 1.5TB and 2TB drives from other manufacturers like Samsung and WD. 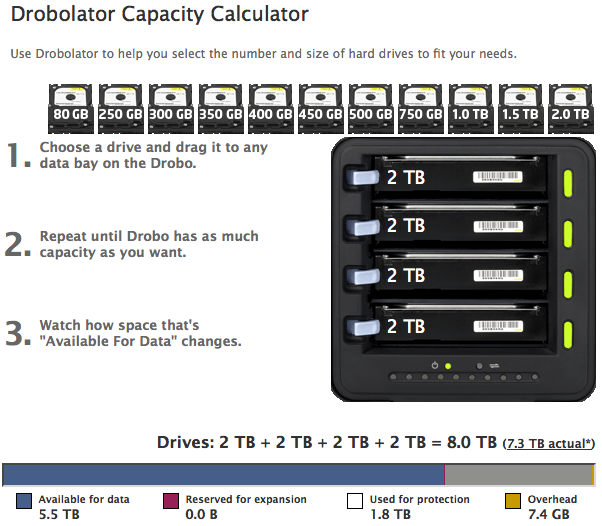 This means, according to the Drobolator, that you can get up to 5.5TB of disk space on a single Drobo unit, which is pretty amazing, but still far from the 16TB limit. I think 16TB is a lot of space to get from a single device, and it should suffice for the needs of most people for the next few years. Cheers to the new and improved Firewire Drobo! 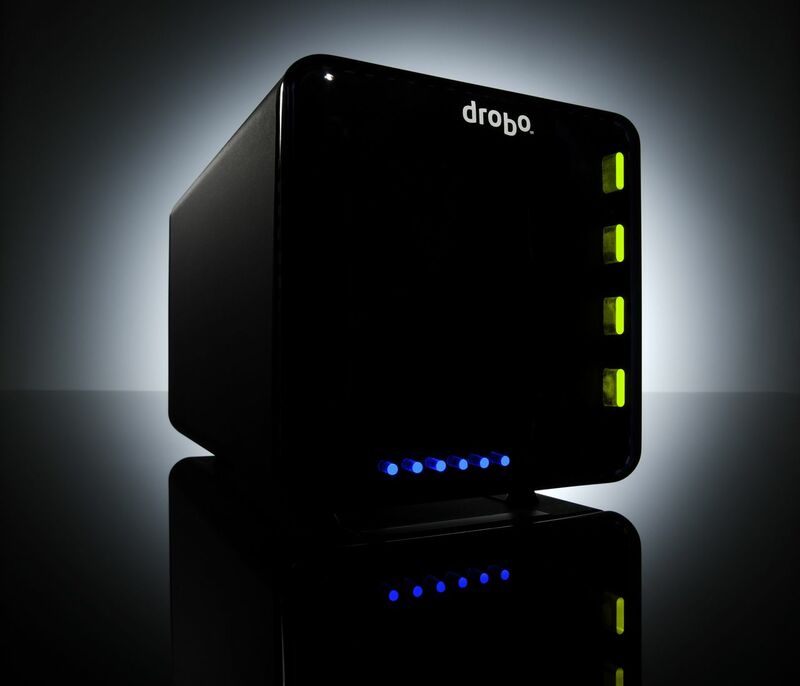 The Drobo is available for purchase from Amazon or B&H Photo. Images used courtesy of Data Robotics. I’m considering getting a Drobo (2nd gen) for my home server. I was running a single USB external hard drive that I shared over all my household laptops (my partner and mine) to do Time Machine backups. Then the drive died but thankfully I did not need to restore anything at the time. I did lose almost 2 years worth of TM backups. Right now I have two external USB drives formatted as a RAID-1 set using Apple’s disk utility RAID solution. It’s slow and the CPU is heavily taxed. Plus disconnecting one of the drives to simulate a HD fault required almost 2 days for the RAID to be rebuilt !!! I have a couple of questions..
1) which harddrives would you recommend as the most silent in your experience with so many drobo units? 3) My “home server” is actually a mac connected to my TV set. All hard drives and the computer itself are hidden in a cabinet underneath the TV, so the noise from the machines is not audible in a quiet TV environtment. Do you think the Drobo will be way too noise even when hidden away in a cabinet? I wouldn’t worry about heat, it has plenty of air since most the back of the TV cabinet is open. Had my Drobo 2 for almost two years connected periodically through 800FW to my 2007 MacBook Pro. It has 4 WB 1.5 TB drives and is almost 65-70% full. I find it incredibly SLOW, too slow to do business on. I have several MyBook external drives at the studio with one copy of projects and then the Drobo at home for a second copy of the projects. I can copy a project (sometimes up to 90 GB) onto the MyBook in an hour or so, but I have to copy it to the Drobo overnight while I sleep. And if it decides to screw up during the night, then I have to try again the next night. It sounds like there’s something wrong with your Drobo or your MBP’s FW connection. My FW Drobo works great. I use it to edit photos almost daily, in Lightroom, and while it’s not as fast as an eSATA drive, it’s adequate. When I copy large files to it, I get rates of about 1 GB/minute or faster. Must be the Drobo as I use the FW connections daily for the MyBooks. I think the Drobo’s out of warranty now anyway, so probably not much I can do about it… Thanks. I’ve been using a Drobo 2nd gen with a 2007 iMac. The iMac has two FW ports: an 800 port that’s connected to my Drobo (which is used for data), and a 400 port that is connected to an old 500 GB drive that I use as a scratch drive for Final Cut Pro. This has worked fine for my purposes. I’m considering moving up to the new 2010 iMac. However, I believe the new iMac only has one 800 FW port. My question is: can I daisychain my old 500GB scratch disk through the Drobo and still get the same kind of performance I need for Final Cut Pro? I think so. We’re talking about daisy-chaining a FW400 drive through a FW800 connection, so the bandwidth shouldn’t be an issue. But I could be wrong. Give it a try and see what happens. Thanks. I’m going to try it through my current iMac (once my adapter comes in on Friday) and see if it works. It’ll be great if it does because it’ll mean I can go with an i7 iMac instead of a costly Mac Pro. I like the new iMac as well. I’d love to get one, but I’m waiting for USB 3.0 to ship on Apple hardware before I bite the bullet. As far as the Mac Pro goes, yeah, it’s expensive, but it’s a real workhorse. You can render video and edit photos all day with that thing, and it’ll keep on going. My Drobo S has 4x WD 2TB green drives and is absolutely quiet! Data Robotics have been working on the noise issue, and I’m glad to hear they’ve managed to get it under control. I’ve been extremely happy with my Drobo. I have 4 1.5 WD Green drives in it and although I love this thing, I find the noise to be unbearable at times. When I do video shoots or voice overs (in the same 20×20 room) I have no choice but to turn it off. Yeah, my 1st gen Drobo gets pretty loud when it’s warm, but my 2nd gen Drobo is generally quieter. DROBO cleaned up my data storage mess. – when doing a file operation operation system spins up drives which can take about 20 seconds before you can continue. http://www.lenspoden.com/ and click on the PHOTO TOPICS tab to read my review. i also purchased a drobo with the hopes of simplifying my storage issue. instead i have had problems with this device since the day i pulled it out of the box. the first thing was that it not take any of my older (known good) drives and use them. the device kept restarting and loosing the connection. at that time i lost my entire iTunes library. contacted support and was given a bunch of directions that helped me milk a cow better than fix this thing called drobo. after buying 3 1TB green disks from WD, i started to pile on data to the array and low and behold, the thing crapped out again!!! sent an email to drobo for support and was told that the firmware was not up to date…. funny thing was that there was nothing available via the little button that states “check for updates”. kept on telling me that the firmware was up to date. the tech said that the drobo was not able to read the sector clusters correctly from the WD drives and this firmware update would fix it. boy was he wrong, not only does the paperweight not work but its not recognized by my MACBOOK PRO but it lost my iTunes data again!!! its crap and i want my money back drobo!!! Ross, it sounds like you had a bad unit from the get-go. You should have asked for an RMA exchange instead of trying to fix it yourself. The second misstep you took was to trust the unit with your data when (1) you knew it had problems and (2) before you forcibly installed the latest firmware from DR. What do companies like Dell or HP or Apple or Microsoft tell you when you’re having problems with your computer? They advise you to install all of the OS patches and fixes there are and bring it completely up to date. It’s the same with the Drobo. If the unit is problematic, why trust it to tell you if its firmware is up to date, when a 2-minute check of the Drobo website will give you better information? Instead of blaming the company as a whole, focus on the problem at hand — your problematic Drobo — and get it fixed or replaced, then see how things go. That’s not good, Bryan. Definitely either get a Drobo or some sort of external RAID 1 array. Losing important data is something that can be easily avoided, but so few people take the necessary precautions. OMG, I was devastated…. reason why I’m mentioning it now simply so that people don’t have to experience what I have gone through. I’m not willing to spend $500.00+ to retrieve them so I’ll have to accept my losses and move on. what is the 5th bay for? protection only??? I just got a v2 firewire drobo, threw in 4 2tb hitachi deskstar drives. But the noise is ridiculous! When the drives are spinning up or just resting, they are perfectly quiet. But for the first hour, after I plugin my drobo on my 27″ iMac, it sounds like it’s writing tons of data between the drives, working them to death. And this happens every time my computer wakes up from sleeping, or if I turn on and plugin my drobo. According to the activity monitor, the computer is not writing anything to the drives. Time Machine is not using the drobo. I thought it might be spotlight cataloging everything, but this happens EVERY TIME my machine wakes up or restarts. According to drobo tech support everything is peachy. No problem whatsoever according to the Drobo Diagnostic log I sent them. Anyone have any problems like this? Any suggestions/recommendations? I am experiencing the same phenomenon with my Drobo with 5 Hitach 2tb drives? If anyone has any suggestions or recommendations in response to Dan’s inquiry, I would welcome them too. Dan and Michael, if I recall correctly, I only own one Hitachi drive, and it’s in one of my four Drobos (I can’t recall which). It is entirely possible that these drives have higher operating temperatures than other drives, which causes the Drobo’s fans to go into overdrive. Not sure why Drobo Support isn’t aware of this issue, but since others using other drives aren’t complaining (yours truly included), this again points to the combination of the Drobo plus the Hitachi drives being the cause of the problem. If I were in your shoes, I’d keep pinging Drobo support and asking them if they’ve heard from any other people regarding this specific drive model + Drobo being a noise issue. This problem is solely related to the 2T drives from hitachi. Doesn’t matter if they are in a Drobo or a standard desktop. They are loud drives. They also operate hot so that doesn’t likely help with the fans kicking in on the Drobo. I swapped out the hitachi’s for some WD 2T drives and have had no issues with the noise at all. Just a heads up: The 2nd gen (USB/FireWire) Drobo with latest firmware (1.3.0), connected via USB to OSX 10.5.7, has a nasty bug that causes the Drobo to randomly hang and/or lose connection to the computer. According to Data Robotics support, this bug may affect the integrity of the data as well. So be warned: DO NOT connect a second gen Drobo to a Mac via USB at this time. My hat’s off to Raoul for his time and effort on this review. Also, it’s amazing he teeters between 1st and 2nd Google rank! Ok, here’s the deal. I have a very cheap MGB RAID PRO (2) bay device I’m using for backups. I’m now a work at home IT guy and need some NAS, iSCSI, etc that I don’t have to spend a fortune on. After several days of research, I have come to the conclusion that my decision is difficult! I use VMWare ESXi running (5) Windows VMs and (1) Linux. I don’t want to run off of NAS or iSCSI, I simply want it there for backups and fileshare. My VM machine is running on (2) 150GB 10K RPM Sata on an Adaptec 2410 RAID card with great performance. This is why I don’t want to run via wire and only want backups. I thought I would simply save my $ by using the MGB but after doing a throughput test, I found that I’m getting 4.5MB/s (mega bytes) and that’s in RAID-zero configuration! Bottom line, that stinks. Here’s the way I see the Pros and Cons of Drobo vs some other device. 1. Can take any mix and match of various HD’s which I have plenty of and throw them in the Drobo, blink, and presto; I have redundant storage. 1. It doesn’t support a mainstream NAS type protocol such as NFS or iSCSI. 2. You must purchase a Drobo Share to release its dependancy on a host CPU. 3. Even with the DroboShare, NFS support via the DroboApp Userland NFS is the older version of NFS v3 and won’t work with VMWare ESXi. 4. You must purchase the DroboPro to get Ethernet, and iSCSI. 1. It’s cheaper than Drobo. 2. It supports NFS v4 and iSCSI making it useable with VMWare ESXi. 3. Built in networking, eSATA, etc. Thx again Raoul for providing a place to voice this review. Pingback: AVforum.no - Musikken skal lagres skikkelig ogsa! Just wanted to follow up on my original comment (#1) in this thread. I had mentioned getting some sort of “drive was improperly disconnected” error a few times after waking up my iMac (and Drobo) from sleep. When I wrote my comment, the error hadn’t shown up in a while, and I haven’t seen again it since. It just occurred to me what was likely the cause of this error, and I’m surprised I didn’t think of it sooner: when I first got my Drobo, I did not yet have any hard drives to put in it. I had chosen free shipping from Amazon, and of course the drives took about a week longer to show up than the Drobo itself did. But being an impatient sort of person, I had connected the empty Drobo to my computer anyway, just to play around with it through the Drobo Dashboard (making the lights blink, etc.). So, in hindsight I’m pretty sure the strange error message I got those few times only occurred when waking up the iMac + Drobo from sleep when there were no actual drives in the Drobo, which is probably something that very few people ever do. So, case closed on that problem, as far as I’m concerned. Still very happy with my Drobo! Thanks for the confirmation, that’s great news. (just saw your other reply too). have also (in ntfs mode), have files over 30gigs (drive images) and it had no problem saving the image file to drobo. @Paul, yes indeed. Worked just fine, on two separate occasions, where I had the two Drobos connected to my MBP for days. I tried both scenarios: USB and USB, both were Drobo v1, and USB and Firewire, one Drobo v1, one Drobo v2. No problems in either case. 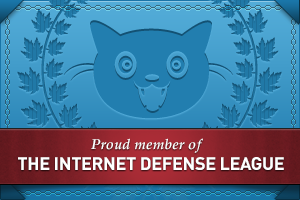 @contempt, to answer your comment, I’ve had no problems whatsoever with the data stored on my Drobos so far. I store documents, photos and videos on them. The documents are small, under 1MB for each, the photos are medium-size (12-100MB or more) and the videos are large (1-4GB or more). WOW that qnap rebuild process is HUGE. Btw you said its good to copy to a 2nd drobo for off-site too, were you able to connect the 2nd drobo (gen1/gen2) to the “same” computer, so that you could do a Copy & Paste from 1 drobo to the other? Thanks for the great review. 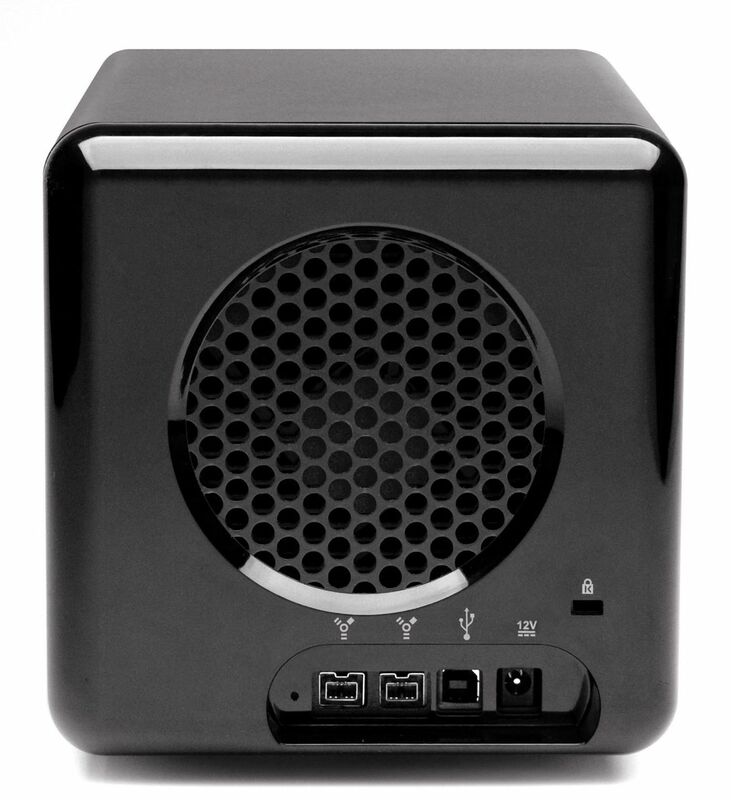 I’ve been tempted for the past week to pick up one of these as my wife’s hard drives are on the verge of failing and I’m thinking of just moving her off of her old Power Mac G5 and onto a MacBookPro, thus the Drobo would work out well. My only fear has been reading a lot of negative reviews and feedback as well, but it sounds like all is fine with you all. No problems with large files? In regards to alternatives, I have an Infrant NV+ running that I absolutely love. But a NAS has a different function than one dedicated to one computer as per the Qnap discussion. I would never use a NAS for day to day activities like I’m planning for the Drobo. For the same price as a Drobo with DroboShare, you get a machine that doesn’t have a USB bottleneck for the NAS capability, supports all the features of Drobo and supports iSCSI as well! For a small business, you could consolidate your storage on one of these – even booting your servers off of it. Amazing. And they already have 6 and 8 slot versions, with rack mount versions of the 4, six and 8 slot units too. They don’t look like they would be quite as simple as a Drobo to get working, and I’m not clear if they support the same sort of thin provisioning that Drobo does (format a partition for more disk space then you have so you can grow into it) but I wish I would have seen them before I bought my Drobo – I would have tried them first. I realize Drobo is working hard on that out of the box experience, and I applaud them for that – but for me I’m willing to trade a little of that for some speed if I can get the same flexibility in array creation. So far these Qnap boxes are the only thing I see coming close to Drobo in that area. Eric, to each his own. I’ve looked at the QNAP, and it’s a pain to configure and operate. Don’t forget you’re still operating with RAID, which means all four drives (or however many you run, depending on the model) have to be the exact same model and capacity. You can’t use drives of different sizes, like you can with the Drobo. Sure, they have online RAID capacity expansion, but that means you still have to replace all four drives to complete the process, and it’s a pain to do. Have you looked at the directions for it? But, if you’re looking for extra speed, it might be faster. You’d also have extra headaches, too, but that’s your call. As for eSATA, don’t forget most people don’t have it on their machines. Laptops and desktops still don’t come with standard eSATA connectors. USB and Firewire are still the main ways to connect external devices. I have a feeling that as eSATA (or some other faster connection, like USB3), Data Robotics will add it to the Drobo. And I also think that at some point, they’ll probably integrate the DroboShare capability into the Drobo, so that you have the networking capabilities built in, without the USB “bottleneck” — but keep in mind that might drive up the price. Like I mentioned in my review, Data Robotics is working on some new Drobo models, and they may be just what you’re looking for. Well, I’ll tell you this, Raoul. I first heard of the Drobo when Thomas Hawk started going on about them back in 2007. Many of his “following” began picking them up, and they all kept saying good things. Since so many photographers were picking these things up, and saying such good things, I knew one day I’d need to get one. But, because of their price tag, it remained out of my reach, until now. It wasn’t until I knew that you, Raoul, were using Drobos, that I decided that this item was a must for me. It was your review, and support, that convinced me. Thanks, Raoul. I knew that I need to safeguard all of my photography. Since I’ve now upgraded from a 6 megapixel camera to a 12 megapixel camera, obviously my storage needs are increasing. With our tax return this year, I allotted some money for a pair of drives and a new Firewire Drobo. I must say, so far, that I’m quite satisfied with the operation. It was a snap to install and get running. In fact, the most difficult thing was moving my iTunes library, which always seems to be a pain. But, my Aperture and iPhoto libraries moved with ease. So, it’s now operating smoothly, and I’m quickly forgetting that it’s even there. I did notice that the fan cycles on and off a bit, but having had all sorts of issues with the fans of the first-generation Drobos — as you could see from my first review — I know enough to realize I should just disregard the noise and move on. It could be worse, and in retrospect, it’s not that bad. I haven’t encountered your second issue — it is interesting though. As to your third issue, I’ll confirm it and take it further: if you’re backing up to the Drobo via Time Machine, the read speeds get ridiculously low during Time Machine operation, and video playback becomes impossible. I think this is a Time Machine and Drobo issue, not solely a Time Machine or a Drobo issue. I wanted to mention this in the review itself, but forgot about it. I should probably write a standalone post about this, just to go further into it. Now, for offsite backup, you could do what I do, which is to buy another Drobo, copy your data to it, then keep it with your parents or some good friends. If they have good Internet bandwidth, you could look into an application that will mirror (rsync?) 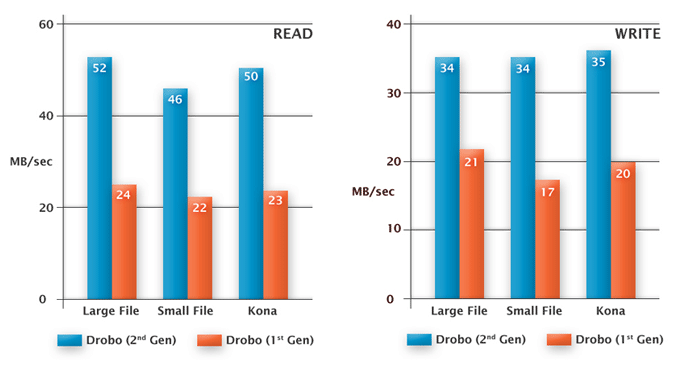 the data from one Drobo to the other. I bought a second-gen Drobo myself a couple of months ago after reading many reviews online, including yours of the first-gen model. The responsiveness of the folks at Data Robotics to comment on reviews such as yours was a positive sign to me. I have to say I’ve been pleased with the purchase. It was one of the most “set it and forget it” devices I’ve bought in years, which is a good thing. 1) I only have two drives in my Drobo right now. They are both 1 TB Western Digital “Green” units, which are supposed to run cooler due to lower power consumption. However, the Drobo’s fan cycles on more frequently than I would have expected it to. It’s not particularly loud, but it is the loudest thing on my desk. 2) The first few times I woke my iMac up after putting it to sleep with the Drobo connected, I got some sort of “drive was improperly disconnected” error from OS X, which would go away as soon as the Drobo itself woke up from sleep several seconds later. That hasn’t happened in a while, even though I didn’t do any firmware updates. Kind of weird. 3) Read and write speeds are sufficient for my needs when I’m just moving files around. However, if I’m watching a video off the Drobo while simultaneously attempting to write other files to the Drobo, the video gets choppy during the write operation. I guess it can’t keep up sufficient read speeds during write operations. Adam, I completely forgot I wrote this article when I responded to you yesterday. As you can see, I did write about the Time Machine/Time Tamer problem earlier this year. Like I said in that article, the best way is to circumvent the issue and to back up directly to a separate drive that you use only for Time Machine backups. It’s what I do, and it works great.